Culms: Erect, rigid, hollow, glabrous. Blades: Flat or occasionally rolled inward, 2-12 inches long, to 3/4 inch wide, green or occasionally blue-green, waxy, glabrous, rough or hairy. Sheaths: Open, shorter than internodes, mostly glabrous. Inflorescences: Spikes, stiffly upright, 2-6 inches long, terminal, partially enclosed in upper sheath or protruding completely. Spikelets: Usually 2 per node, sessile, 2-6-flowered; glumes equal, thick, rigid, yellowish, 1/2 to 1 inch long, 3-8 ribbed, often strongly bowed out at bases, awnless to long-awned; lemmas shorter than glumes, awns straight, 1/4 to 1 inch long. Habitat: Bottomlands, low prairies, stream banks, and edges of woods, in moist, fertile soils. 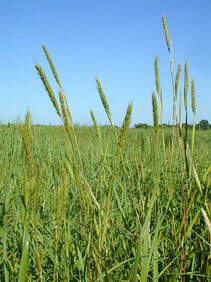 Forage Value: Virginia wild rye is palatable and nutritious for livestock, but it becomes tough when mature. It makes good hay when cut early. Comments: Tufted. Virginia wild rye decreases with overgrazing.